For SISO responses, t and y are vectors with the same length NS. For responses with NY outputs, you can specify y as an NS-by-NY array and yfinal as a NY-by-1 array. lsiminfo then returns an NY-by-1 structure array S of performance metrics for each output channel. S = lsiminfo(y,t) uses the last sample value of y as steady-state value yfinal. s = lsiminfo(y) assumes t = 1:NS. S = lsiminfo(...,'SettlingTimeThreshold',ST) lets you specify the threshold ST used in the settling time calculation. The response has settled when the error |y(t) - yfinal| becomes smaller than a fraction ST of its peak value. The default value is ST=0.02 (2%). 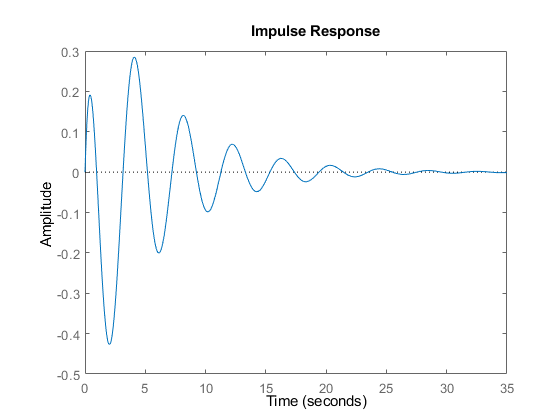 impulse returns the output response y and the time vector t used for simulation. Compute the response characteristics using a final response value of 0. 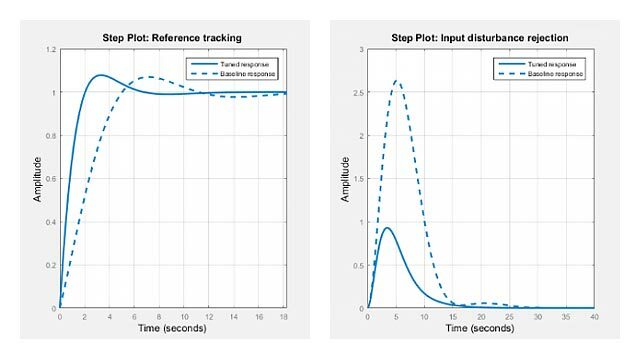 You can plot the impulse response and verify these response characteristics. For example, the time at which the minimum response value (MinTime) is reached is approximately 2 seconds.